Free WordPress Theme Seos Magazine. Seos Magazine is a modern, responsive, WordPress theme. Seos Magazine is 100% responsive built with HTML5 & CSS3, The theme is tested for speed, there are no mistakes in the HTML code. The Theme is ultra fast and SEO friendly. 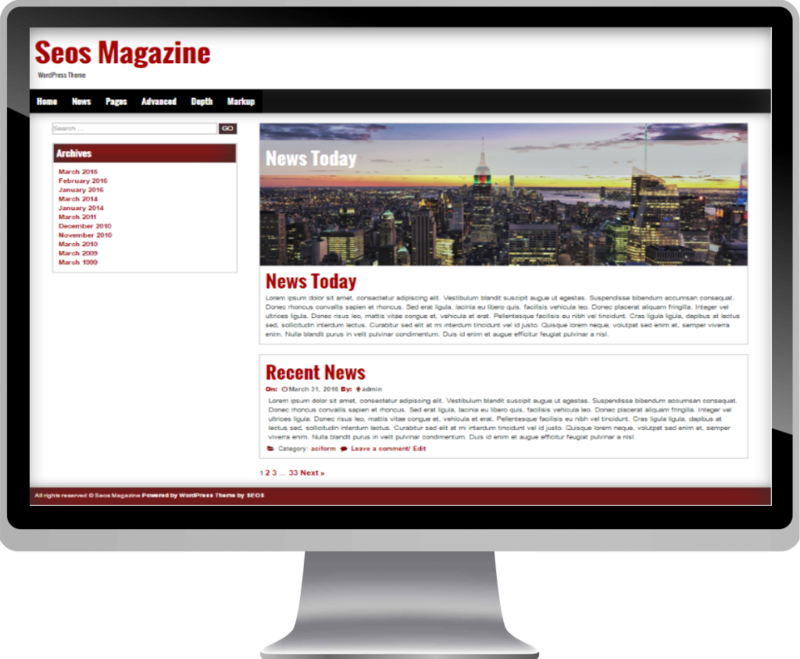 The Seos Magazine theme is excellent for a news, newspaper, magazine, shop, publishing or other editorial websites. Theme is translatable so you can easily localize it in the language you want. To learn more about the theme please see below. Compatible Browsers IE9, IE10, IE11, Firefox, Safari, Opera, Chrome. Unlimited websites. WooCommerce – Declared support for WooCommerce. It allows you to create a shop. News Slider – In your admin panel, go to Appearance -> Customize. Animations Site Title – 48 animation effects and animation speed option. – In your admin panel, go to Appearance -> Theme Options. Animations Slider – 48 animation effects and animation speed option. – In your admin panel, go to Appearance -> Theme Options. Animations Post and Page – 48 animation effects and animation speed option. – In your admin panel, go to Appearance -> Theme Options. Recent News – In your admin panel, go to Appearance -> Customize. Social Media – Facebook, Twitter, Google+, Linkedin, RSS, Pinterest, Youtube, Vimeo, Stumbleupon. In your admin panel, go to Appearance -> Customize. Header Logo – In your admin panel, go to Appearance -> Customize. Footer Options – In your admin panel, go to Appearance -> Customize. Back To Top Button – Options – In your admin panel, go to Appearance -> Customize. Theme Options – Sizes – In your admin panel, go to Appearance -> Theme Options. Custom Main Container – In your admin panel, go to Appearance -> Customize. Custom Site Title Color – In your admin panel, go to Appearance -> Customize. Custom Site Title Hover Color – In your admin panel, go to Appearance -> Customize. Custom Site Description Color – In your admin panel, go to Appearance -> Customize. Custom Social Media Background Color – In your admin panel, go to Appearance -> Customize. Custom Menu Color – In your admin panel, go to Appearance -> Customize. Custom Menu Hover Color – In your admin panel, go to Appearance -> Customize. Custom Menu Background Hover Color – In your admin panel, go to Appearance -> Customize. Custom Menu Border Right Color – In your admin panel, go to Appearance -> Customize. Custom Slider Color – In your admin panel, go to Appearance -> Customize. Custom Slider Hover Color – In your admin panel, go to Appearance -> Customize. Custom Anchor Color – In your admin panel, go to Appearance -> Customize. Custom Anchor Hover Color – In your admin panel, go to Appearance -> Customize. Custom Aside Title Background Color – In your admin panel, go to Appearance -> Customize. Custom Entry Footer Colors – In your admin panel, go to Appearance -> Customize. Custom Body Colors – In your admin panel, go to Appearance -> Theme Options. Footer Widgets – In your admin panel, go to Appearance -> Widgets. Custom CSS – In your admin panel, go to Appearance -> Theme Options. Under Construction – In your admin panel, go to Appearance -> Theme Options. Shortcut Icon – In your admin panel, go to Appearance -> Theme Options. Sidebar Position – In your admin panel, go to Appearance -> Theme Options. Google Analytics tracking code – In your admin panel, go to Appearance -> Theme Options. Google Fonts – In your admin panel, go to Appearance -> Theme Options. Font Awesome – The complete set of 605 icons in Font Awesome 4.5.0. 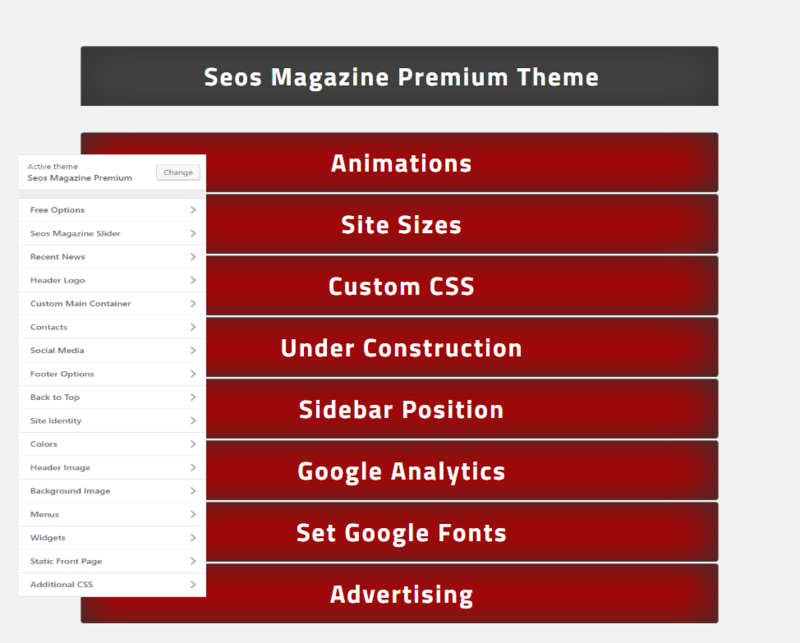 You can change the colors of your site easily using Seos Magazine.